Virgin Media has successfully tested 3D television through its existing cable infrastructure and on its current set-top box. A source within the cable company told TechRadar that the trials, which took place on a closed VoD network over the last few months, had been a complete success and prove that Sky is not the only company that can carry the higher-bandwidth programming through its infrastructure. 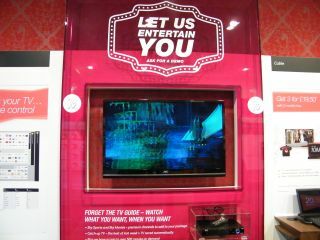 Virgin Media is showing off 3D television in its new store on Oxford Street, running on a V+ box, and the cable network is capable of running 3D programmes through its network should demand become high enough. "Virgin Media is always looking at new technology to see if it is something we would like to offer as a service to our customers," a Virgin Media spokesperson told TechRadar when asked about the trial. "We are currently investigating 3DTV and wanted visitors to our Oxford Street store to get a taste of some of the 3D content that is being produced and experience this technology for themselves." Sky made a real splash with a 3D demonstration at the end of 2008, and had insisted that it will be carrying 3D programming by the end of 2010. But it appears that one of its biggest rivals in the UK is making sure that it doesn't get left behind should the experiment prove to be a success. The 3D being talked about by both Sky and Virgin is completely different from the anaglyph tech being shown in Channel 4's upcoming 3D week - using polarised technology that still needs glasses but not the much-derided red and cyan lenses. To view the 3D, the viewer will need a 3D enabled television; still difficult to get hold of and considerably more expensive than traditional television sets. The 3D demonstration at the Oxford Street store has been billed as the first public demo of this tech in the UK, and is likely to draw thousands of intrigued viewings from Christmas shoppers. "For the very first time we're also showcasing exciting 3D television which I hope will give people a fun break from the hectic rush of Christmas shopping," said Virgin Media's Peter Taddeo last week at the announcement of the store.